Lusiana Traditions: Christmas Open House! It was so much fun to see old friends and meet new friends! P.S. We do appreciate your business so much! for you every wish on your Christmas List! 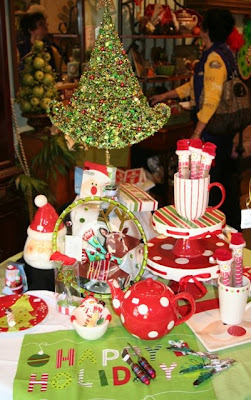 Candlewick Cake Pedestal, and Festive Holiday Guest Towels! Goodies for the Christmas Table! I sure hate that I missed it. I wanted to come so bad but we had family Christmas pictures that day. Hopefully I can make it to the next one! Thank you Amy! I'm sorry we didn't get to see you Saturday, but I know about picture schedules and little ones! EC is just too cute! I am keeping up with her on her blog and facebook! I can't wait to see how she has grown! Hope to see you both really soon!